A festival was a great hit in Bavaria and it has never stopped. Since 1880, Oktoberfest has been celebrated in front of the historic city gate. This all happened when Prince Ludwig married Princess Therese of the Saxony of Hildburghausen. The couple decided to have a grand wedding party outside the Munich City and there are 40, 000 Bavarian people who came along to celebrate. During those times, it was incidentally given the current name of the meadow as Thereseinwiese to honor the princess. Every year, during the anniversary of their wedding, he repeated to show his love. Until now, Thereseinwiese is still the place used for this annual Oktoberfest. 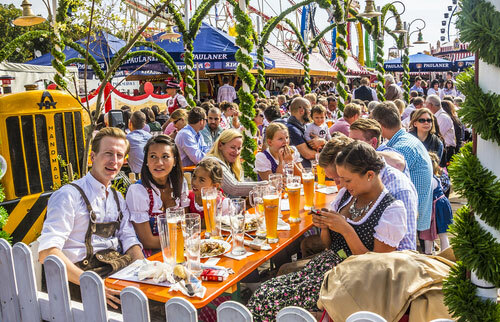 For almost two centuries that passed, Oktoberfest is considered to be the most world’s largest festival across the globe. As the years goes by, there are lots of changes in this kind of event such as instead of horse races, beer tents were installed to be occupied by the thousands of thirsty people who want to join the celebration. The swings at the early time were now changed to roller coaster. Before, it was a kind of celebration of love but now it is . . . well still a celebration of love. A love of beer that is. Oktoberfest is not just a celebration about the beer but also a celebration of drinking Oktoberfestbier. The real definition of Oktoberfest beer is that it is an authentic Oktoberfestbier that is brewed by breweries only in the city of Munich. These are the only allowed beers in the annual celebration in the Oktoberfest. The other beers that are brewed must be labeled with Oktoberfest style and not brewed in fall. They should be the outgrowth of traditional and strong spring of brews that is called beers of the Mӓrzen and put it in a cave filled with ice or from cellars to be used during summer. And the left beers are finished off in October wherein fresh beer that is made from grains needed to put in the cask. Oktoberfestbier are the well-age beer that last for 3-4 months of storage that has a deep amber color with 5-6.2% of alcohol. Mӓrzen is a kind of Bavarian beer that started late 15th century. The brewing occurred during March and it is much prohibited to brew the beer in summer to avoid spoilage. The Oktoberfest beer has lots of characteristics to be proud of because they are a slightly alcoholic lager, the color is golden body having white head or it has a dark copper or amber color. The smell will depend on how strong your brewery makes it. For instance a strong Vienna or a Munich will provide a predominant aroma. It has a flavor of malts that also comes from different varieties such as biscuit malts, sweet malts and toasted malts. The texture has a moderate carbonation and with overall creaminess, quite dry and crispy that result from long fermentation.